It’s been three months since we have moved into our Airstream. THREE WHOLE MONTHS. Can you believe that? There have been no suspicious murders. We are still married, and we are not moving out just yet. Life is good. Naturally, I had some hesitations about just putting our life into storage and moving into an Airstream (who wouldn’t? ), but the other alternative was to start house shopping in Houston which I am not emotionally ready to do yet. In choosing the former option, I am at least able to experiment with a tiny and more mobile lifestyle I’ve secretly coveted since the purchase of our first RV last year, and I am thrilled that we did. I have gained so much more, more sanity, more time, more freedom and more experiences in the past three months than I have in the entire year and a half we’ve been down here. Worth it is an understatement. There are specific improvements I am after in my life right now, and in three months I can say I have certainly gained three of them. In three months I’ve already gained more time, freedom and clarity. I can’t believe how much I am able to do without the weight of a house, stuff, errands, chores, and all the typical baggage of adult life. I’m not saying they are non-existent (we aren’t on permanent vacation here, we live and work in Houston like normal people) but it is true that as you go tiny, these get smaller. Very true. 100% Gospel, guys. Freedom. This, all of this. The freedom of living in an Airstream even if maybe like us you have to maintain a home base is incredible. I’m almost at a loss for words on this one. I’ll never forget the first weekend trip we took after moving in, and I just watched the Houston skyline drift from my view thinking about the great weekend ahead that I didn’t have to pack for, that I could chase on a whim because my life is encapsulated in this tiny house behind us on wheels. I want to check out a festival in Austin, hike Hill Country, see friends in Mobile, have margaritas in San Antonio, grab beignets in New Orleans we hitch up, and we are out. I am not thinking about the lawn that has to be mowed, the mulch that needs to be ordered, the garage that needs to be cleaned, none of that. I am sure I will be eventually, but for now, I don’t want to. Ryan’s job has caused us to move a considerable amount, and honestly, I don’t want to be weighed down like that until I’ve experienced what our new state has to offer. Every move has been worth it, and Ryan has gained so much, but his flexibility on agreeing to this tiny life means I’m getting what I want out of these moves too, and it seems to be a fair trade because we are having so much fun traveling more as a family. Clarity. Removing all the restrictions and weight of a conventional lifestyle and replacing that with time and freedom was like ripping blinders off. While you don’t necessarily have to move into an RV or a tiny home to do this I cannot advise strongly enough on implementing a routine or degree of minimalism into your life to help you see where changes, improvements or adjustments need to be made. I had more time to think, explore and do and I realized that between work, life, family, motherhood, marriage and EVERYTHING else I was over scheduled, overworked and overextended. With more time to do things that I enjoy my real talents took center-stage again, getting noticed and sending more opportunities my way that align with the person I want to be and the career that I want to have. By regaining clarity into MY life I was able to make some changes with minimal risk and fear. Let’s just say some things made the cut and other things didn’t. 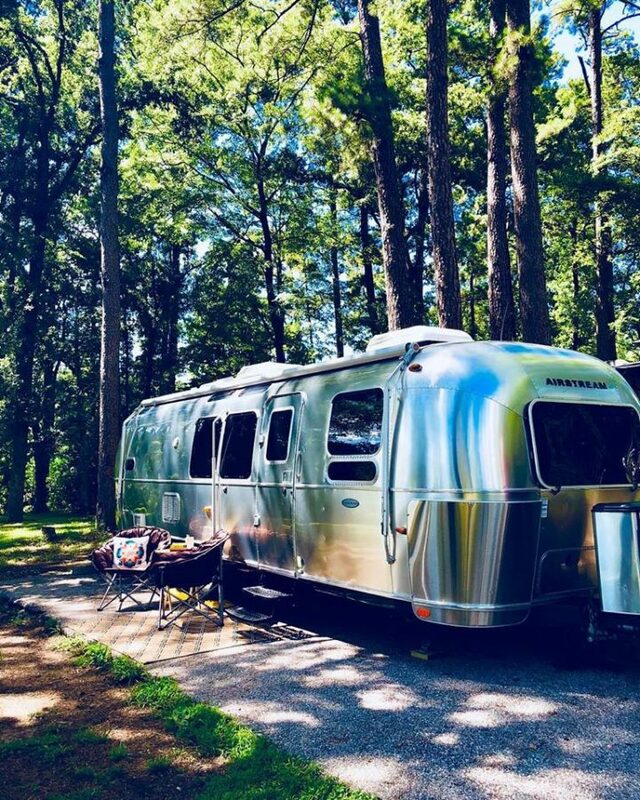 By embracing minimalism through Airstream living and travel I was able to do more than wipe the slate clean, I was able to rebuild during a time in my life when I really needed to. If I’ve learned anything in the past three months that I will not only remind myself but impart onto you my dear friends is that no matter how awesome your life may be, how bad your life may be or anything in between never feel afraid to press that reset button and chase what you know is right for you. Sounds like y’all are hitting your groove! I’m glad to hear Airstream life is treating you well and that you’re getting good things out of it. Taking the opposite approach, I bought a house! With this move, I fully intend to downsize; I’ve segregated lots of stuff that won’t make the move, thrown away tons, and plan to get rid of more as I unpack (I know, but I’ve always had a bad habit of moving stuff, then getting rid of it). That’s great! Congratulations! Home ownership is amazing! We look to do that (fingers crossed in Houston) and I know after this experience I’ll definitely be bringing some minimalism into that lifestyle too! Enjoyed your blog as always. Our rv adventures ended in 2004 and I am still in minimalist lifestyle. My 900 sq ft mobile home is even more room than I need. The rv park models you see in campgrounds would be ideal but I am finding it is more expensive for rent in a campground or rv resort than in a regular 55+ mobile home park. Go figure! So glad you are enjoying those moments. Spent Labor Day weekend with Josh, Diana and Arden in Maine. That young lady has some energy. Oh Arden! She is so energetic! I think I will always stick with minimalism now. It’s been good for me and I’m glad to hear you’ve stuck with it too!